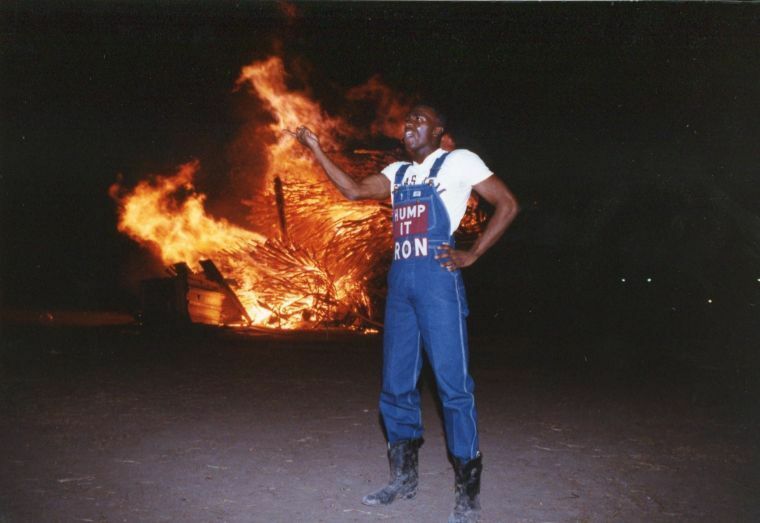 Ronnie McDonald was the first black yell leader at Texas A&M. Ronnie McDonald had a less-than-ideal beginning to his career as a Texas A&M's yell leader. He recalls his first Midnight Yell Practice, wanting to prove himself, and doing his requisite push-ups "110 percent." "I was so excited, and sweating a lot," he says. "And then all of a sudden, I got sick, and I started throwing up. This young lady came up to me and said, 'You make me sick. You're the worst yell leader ever, Ronnie.'" However, in his time as yell leader, he managed to win over even the most skeptical Aggies. "Later on, at a game, that very same young woman came up to me and said, 'Man, you're the best yell leader ever!'" McDonald says. "And that just goes to show that there are ups and downs, and you can't let that moment define you." McDonald grew up in Bastrop, and didn't fall in love with A&M until his senior year of high school. His mother's manager at Dairy Queen was an Aggie, and helped set up a campus visit for McDonald. During his visit, McDonald met administrators, learned about campus traditions, and was hooked, he says. He became the first person in his immediate family to go to college, McDonald said. In his sophomore year, McDonald ran for yell leader, seeing it as a good step toward running for student body president. McDonald's campaign was unique in more than one way: he was a "non-reg" candidate, as in not a member of the Corps of Cadets. There had also never been a black yell leader at A&M. "There were a lot of people who thought that a yell leader who wasn't in the Corps was breaking a lot of traditions," McDonald said. "But it was the opportunity to bridge a lot of gaps." McDonald ran a campaign focused on the diversity that was already present at A&M. "I had a slogan where I said that A&M was like a rainbow, where you don't focus just on one color, but they all come together to form one thing," McDonald said. "All the different student groups are the different colors. You see the Corps, you see Aggies for Christ, you see all of these different groups and organizations, and they all come together to show who we are as Aggies." McDonald won the election, and became the first black yell leader in A&M's history. He said being an Aggie "transcended color, background and financial status." "It was all about being part of a family," he said. "Being a yell leader at Texas A&M allowed me to really be able to enjoy that experience. 'We are the Aggies, the Aggies are we. True to each other as Aggies can be.' And you wanted everyone to embrace that." McDonald says his role was "a tightrope" at times, but that "there were way more people who were supportive" than critical. "I remember dealing with individuals that thought, 'Maybe he's not going to be traditional enough,' or African-Americans saying, 'Is he going to be a sellout?' All those different things were at play," he said. "But at the end of the day, you just say, 'Hey, I'm a yell leader. I represent Texas A&M.'" The campaign trail also left McDonald with something more lasting: He met his wife, Ty, while campaigning. 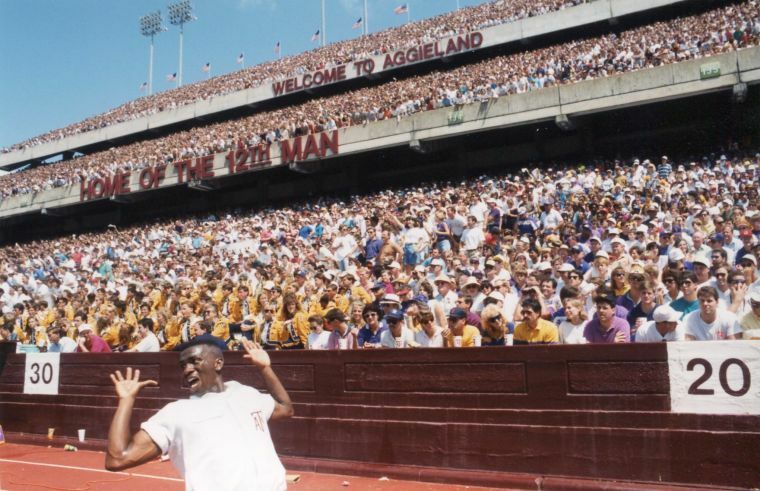 McDonald was elected yell leader until his graduation in 1993. He continued trailblazing after college. He became Bastrop County's first black judge, and, at 27, the youngest in Texas history. He served in that role for 14 years. McDonald returned to Aggieland in June 2013, as the executive director of community relations and strategic partnerships for Texas A&M Agrilife. He works with the forest service and the Texas Rural Leadership Program. "You see a lot of change," he said of his return to campus. "I remember when I was yell leader, you used to have all the old Ags talk about how things used to be. Those guys seemed to be so old. Now when I come back as an old Ag, it's a unique experience." McDonald said the role of yell leader had a lasting impact on him. "Being yell leader was a tremendous position," McDonald said. "It was just a great opportunity. I can say, just like anyone else who wore those whites, my life has been changed." "Yelling at Kyle Field is unlike any experience," Ronnie McDonald recalls. "You see on a Saturday afternoon over 80 thousand people all unified on one accord, applauding for one team, for one spirit. You see individuals from all different walks of life. And everyone is sweaty and stinky, and even so, they all join together. They put their arms around each other and start to sway for the Aggie War Hymn."